Where transit vehicles run adjacent to the curb, passengers board and alight directly from the sidewalk. 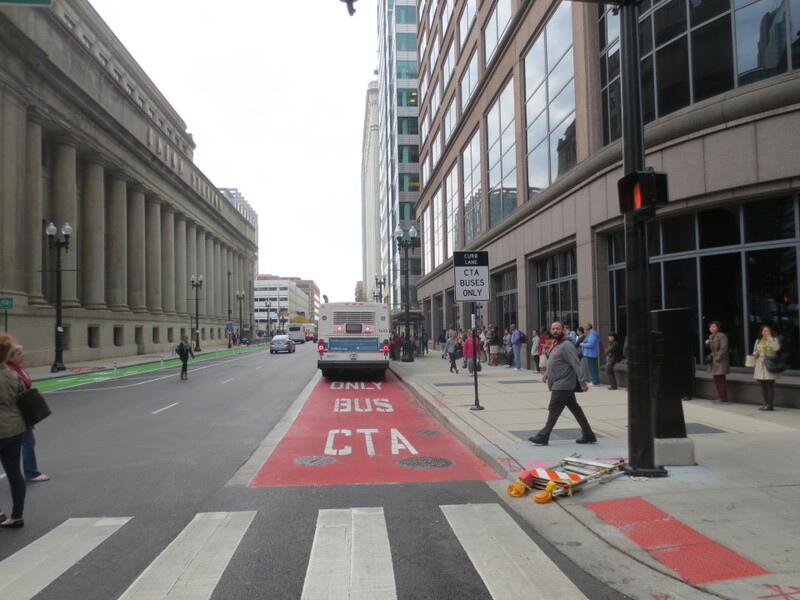 Curbside stops are also often observed in dedicated transit lanes, where pulling out of traffic is unnecessary. Along curbside running ways in either mixed traffic or in dedicated transit lanes. On mixed-traffic streets with low or moderate transit frequency, and with posted speeds at 30 mph or lower. With dedicated curbside transit lanes, including dual and contraflow transit lanes. Sidewalk stops on the existing curb are typically the lowest-cost treatment, requiring only signage and an ADA boarding area to receive transit passengers on the existing curb. Along curbside running ways, the curbside sidewalk stop may be the only option. 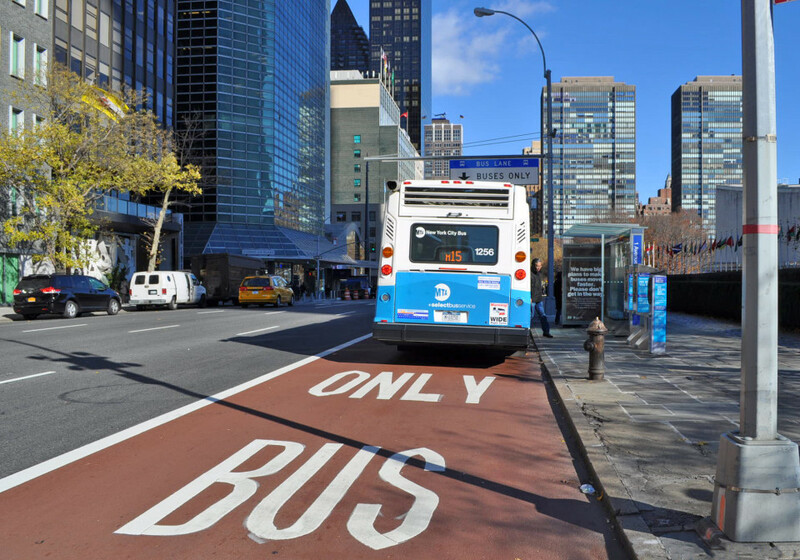 Where pull-out bus bays (or “lay-bys”) can be filled in to create in-lane curbside stops, buses save time and reduce wear, while improving pedestrian space. Where transit is not provided with a dedicated lane, making stops may cause traffic following the transit vehicle to queue behind it. On two-lane, two-way streets where overtaking a stopped bus may create hazards, consider measures to prevent vehicles from passing. Stop zone must be 10 feet clear of the crosswalk or curb return whether near- or far-side. Stop length must equal the length of the bus, and curbside boarding area should include both the front and back doors. Ensure stop amenities do not block accessible boarding area or travel path. 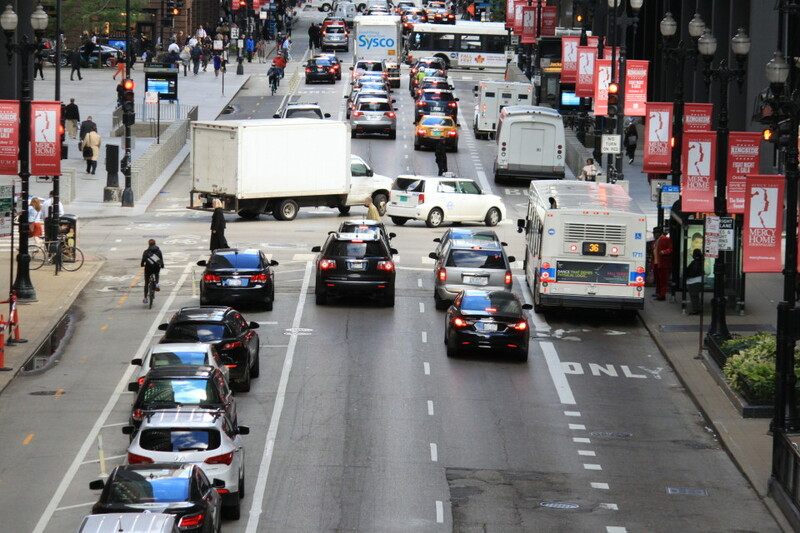 Red transit lanes enhance motorist and pedestrian awareness of curbside transit lanes and transit vehicles. Shelters, even narrow shelters, improve passenger experience and establish the stop as a place for transit. Consider omitting shelters on narrow sidewalks where pedestrian flow would be impeded. Implementation of sidewalk and transit stop improvements along a transit corridor in Portland yielded a 12% reduction in paratransit trips taken by conditionally eligible riders, sugesting accessibility and stop improvements draw riders to fixed route service. Russell Thatcher and Caroline Ferris. Strategy Guide to Enable and Promote the Use of Fixed-Route Transit by People with Disabilities. TCRP Report 163, Transportation Research Board (2013). In constrained conditions where width prevents dedicated bike and transit facilities from being provided separately (13 feet or less). Mark advisory bike lane to the left of the bus stop; place the seam of the concrete bus pad to either side of the advisory lane, as seams and cracks pose a hazard to bicycle wheels. 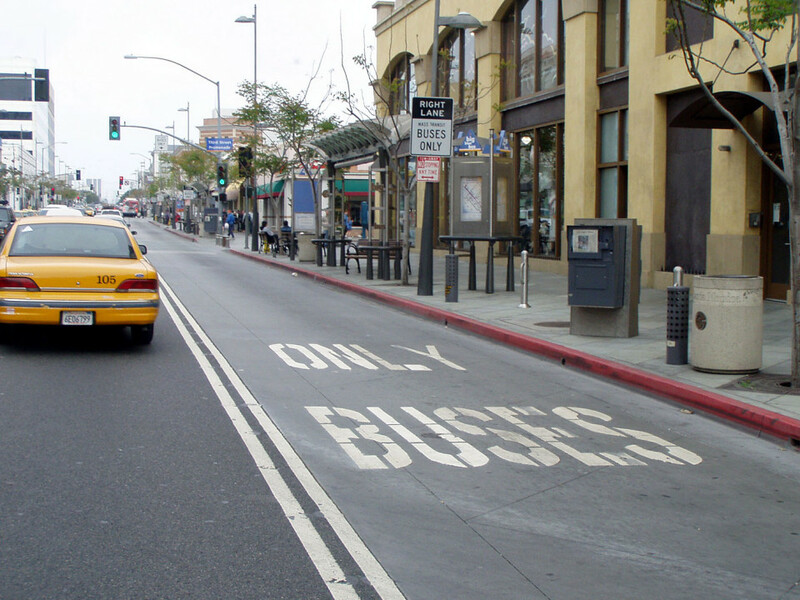 Position shared-lane markings to the left side of the bus-bike lane. References for In-Lane Sidewalk Stop: 2 found. Russell Thatcher and Caroline Ferris. "Strategy Guide to Enable and Promote the Use of Fixed-Route Transit by People with Disabilities." TCRP Report 163, Transportation Research Board, Washington.